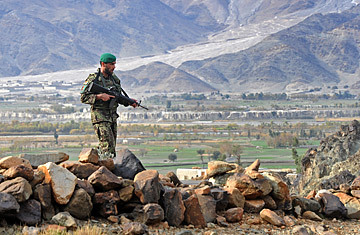 n Afghan National Army on patrol in Kunar province. There was nothing unfamiliar about last month's hours-long gun battle between Afghan security forces and insurgents in Nuristan province  except the identity of some of the militants. Of the 40 or so fighters killed, Gen. Mohammad Zaman Mahmoodzai, head of Afghanistan's border security force, says about a quarter had carried documents implicating them as members of Lashkar-e-Taiba (LeT), a Pakistan-based outfit better known for its role in the Kashmir insurgency and the 2008 Mumbai terror attacks. The general claims that recent months have seen a steady increase of violent clashes in the east that have yielded a higher ratio of Pakistanis and other foreigners among the insurgent casualties. That, he says, is proof of the nominally Kashmir-oriented group's growing involvement in Afghanistan. The trend is confirmed by U.S. military officials, who say that well-trained LeT fighters are bringing deadlier tools and tactics to the war's second-fiercest front. With NATO's attention fixed on the southern battle zone where the Taliban is strongest, the LeT, or "Army of the Pure," has aligned with a host of militant groups that have ramped up attacks against Afghan and U.S. forces in the borderlands and beyond. Since they began tracking the group's involvement in Afghanistan in 2008, U.S. officials say the LeT has expanded from a small presence in Kunar province to multiple cells in at least five provinces, actively collaborating with everyone from the Afghan Taliban to the Haqqani network. Kunar and Nuristan remain their focal point, provinces where the U.S. military shut down several remote, heavily targeted bases in the past year. But when NATO in July announced the arrest of two Taliban commanders accused of aiding the LeT, a statement noted the influx of LeT foot soldiers in Nangarhar province, an important commercial center and military supply route. A spike in suicide- and roadside bomb attacks against convoys and government officials have disrupted the once stable area, and Afghan security officials allege the LeT is providing fake documents to attackers. Originally nurtured by Pakistan's spy agency, the Inter-Services Intelligence (ISI), as a proxy force to drive India out of Kashmir, the LeT has since raised its profile with spectacular strikes on India's parliament and commercial capital. It was banned by the Pakistani government in 2002 under pressure from the U.S., although the organization continues to operate freely there via thinly disguised front organizations. But according to Stephen Tankel, a U.S.-based analyst and author of the book Storming the World Stage: The Story of Lashkar-e-Taiba, "Lashkar was never just a Kashmir-centric organization and always had ambitions beyond the region." Today, he explains, some cadres are motivated by anti-Indian sentiment; others want to wage war against America. Because of increased Indian influence in the government of post-Taliban Afghanistan, these jihadist desires converge. And while India remains its main enemy, anti-Western activity by the LeT is nothing new  as the arrest of operatives as far away as the United States shows. "What we're seeing now is an acceleration of trends that have been in place," Tankel says, "rather than Lashkar trying to go in a new direction." The LeT's presence in Afghanistan has coincided with mounting Pakistani concern that India's influence in Kabul represents an Indian strategy of encirclement. Ensuring a friendly regime in Kabul was the reason for the ISI helping the Taliban seize power in Afghanistan in 1996, and U.S. officials suspect ongoing Pakistani support for the Afghan Taliban since the movement's ouster by U.S.-led forces in 2001. U.S. intelligence officials also suspect a direct Pakistani hand in some attacks in Afghanistan, notably the mid-2008 Indian embassy bombing in Kabul that left 58 people dead. More recently, Afghan intelligence officials blamed a Feb. 26 attack on a guesthouse in the capital on LeT operatives. (Half of the 18 killed were Indian nationals.) Pakistan, for its part, has denied any responsibility, insisting that its priority is its battle with its domestic Taliban insurgency. But in light of its long-standing reluctance to crack down on the LeT  and alleged involvement in attacks in Afghanistan  Tankel says we "must take seriously" the possibility that elements within the ISI are making use of LeT militants in Afghanistan, even if "there's no smoking gun." While there's some dispute over just how substantial the LeT presence in Afghanistan really is, Afghan and U.S. officials agree that the group's role is likely to escalate as Western forces begin to withdraw and Pakistan tries to strengthen its influence. What's more, some contend, the LeT's threat should not be measured in numbers. Given that its training program was developed by the Pakistani army, its operatives are still considered among the most capable at small-unit tactics and explosives, making them ideally suited to the low-intensity Afghan conflict. "A few well-equipped pros who go around teaching and coordinating can do a lot more damage" than your average Taliban guerrilla, says the senior U.S. military official, noting the increased level of cooperation. "They're already having a big impact."